I went to the 2016 Consumer Electronics Show with an edict from my bosses: “Don’t just stand around and complain that there aren’t any manual-transmission rear-drive lead sleds there.” Don’t worry, I found one anyway, and it’s a fantastic old Acura NSX! 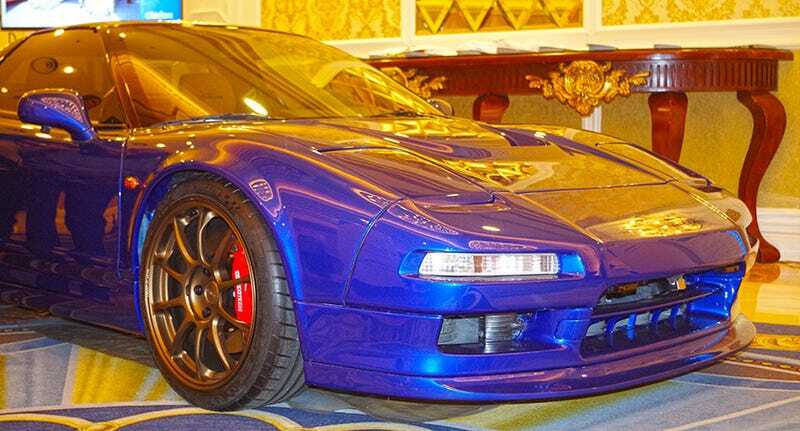 Car stereo company Clarion had this 1991 NSX on display under the chandelier lights of the Westgate Casino, and wow just wow, as they say on the Internet. I suppose you can’t call anything with a subwoofer in the footwell a “purist” build, but damn if this thing ain’t clean. They basically took the idea of the NSX and accentuated it. Which is what almost every tuner says, but Clarion seems to have held the line pretty tight on this. It’s a little throwback to the first Fast & Furious-era tuner cars with redundant screens and an absurdly overpowered audio system, but for the most part the styling’s remarkably reserved and I could just about drown in that paint color. Open the door and smell the immaculate leather; feast your eyes on the sweetness of the tan interior! The color scheme reminded me of one of my all time favorite looks: the LeMans blue-on-Caramel option on the E39 BMW M5. The longer I stare at these images, the more sure I am that this is my all-time favorite modified NSX. It’s only one excessive footwell subwoofer away from perfection! That thing’s just silly. But props to Clarion for saving the car from a wretched fate, pulling it out of a lot in tattered shape with more than 200,000 miles on the odometer. Now it’s pretty much the perfect slightly-modernized first-gen NSX so many of us dream about. The lighting in this gilded hallway was too weird to get great photos, but you can actually watch the whole car be build on Clarion’s YouTube channel. The vehicle will end up in the hands of some lucky sucker soon, as Clarion’s raffling it off.